This is an area where you should spend some time reviewing the information that would be presented to users of this directory. Some of descriptions have been provided but they are not all-inclusive. They are meant to help you get started for the implementation of your directory. From a security standpoint you should limit the number of people who have access to update and/or add information to the address area. The following descriptions of each area will be to highlight those fields that you might have questions. The following is a picture of name fields. 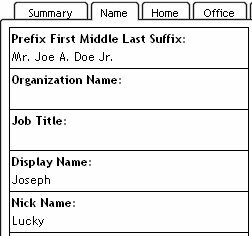 Joe is entered in the first name field, Joseph in the display field and he likes to be called "Lucky". There are two areas defined for address information. The following is a picture of the fields associated with the Home address. There are two areas that should be mentioned. This function is to define which address will be placed first and second when it is displayed (i.e. which is the primary address of this person). 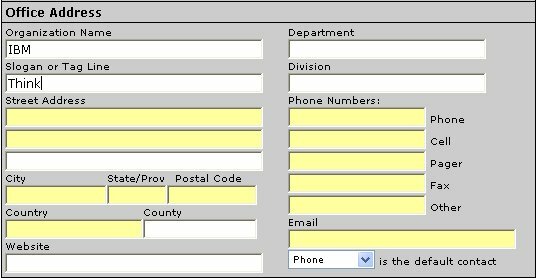 This drop down list specifies the primary way this person wishes to be contacted. If you place your cursor over the Icon in front of the phone number, it will display if this home, cell, work, etc. In the above example, the primary number is home. 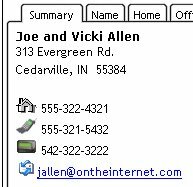 If you click on the Email address, it will initiate the email note with jallen as the recipient. The following is a picture of the fields associated with the Office address. The fields for the office address are similar to the Home Address area. 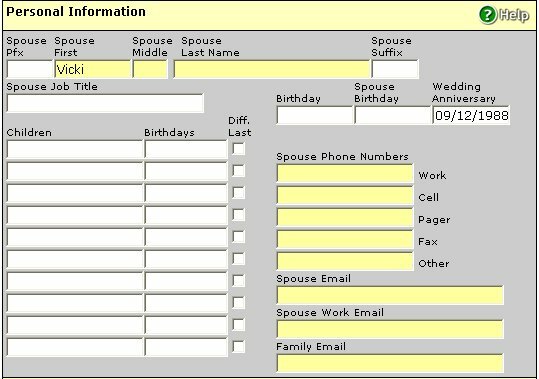 The following is a picture of the fields associated with the Personal Information. If you are unsure of the field definitions and usage, you should click on the Icon. The following is a picture of the fields associated with the Privacy Level. The radio buttons are set for one of the three options. The "Private, only I can see it" means that the person who created/updated this record is the only person who can view the information in this record. Each record in the address area can have its own privacy designation. As an example, John Doe could be private to this organization/directory and Jane Doe could be public. This means a guest logging into your directory could see Jane Doe and her address information, but could never see John Doe and his address information. The following is a picture of the fields associated with the Ownership. Enter the userid of the person that you would like to own this record. All records owned by a given invidual can be updated by that individual. The following is a picture of the fields associated with the Groups. In this area you define which groups using the check box, if any, this individual belongs to. You can define a new group in this area and it will update the master records in the database with the new group. This is a free format area to add any appropriate comments about this individual(s).